The Montecristo Edmundo is a cigar more powerful than it looks, of 52 ring gauge, 5.3” (135mm) long and comes in aluminum tubes in a box 15 cigars. Even if it packs a punch, it is smoother than most other Montecristos. 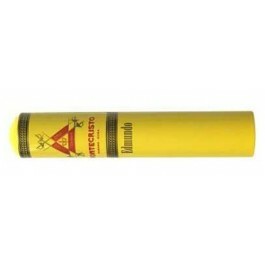 It is a very round and balanced smoke of medium to full body, with a flavor profile typical Montecristo. The Montecristo Edmundo is a well rounded, balanced, mild and smooth smoke. •	The tobacco leaves used to prepare this exquisite cigar are chosen and used exclusively for this vitola, carefully grown in region of Vuelta Abajo in Cuba. •	The Edmundo is surely a great addition to Montecristo’s lineup. It is medium to full flavor, with a perfect balance of aromas and flavors. 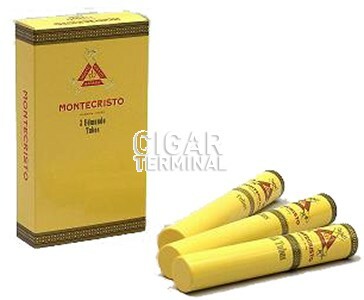 This cigar is for lovers of the classic Montecristo brand. The Montecristo Edmundo has a perfect construction, with a reddish shade. Pre-light aroma is light and, with some hints of flowers. The Edmundo presents an even burn line, and there is a nice ash on the cigar of charcoal gray that holds firm until tapped. The draw loosens up a bit in the second third. Remains cool throughout. Smooth spice, nuts, and leather dominate the outset; quite a bit of flavor for a cigar that has such mild pre-light aroma. The middle third opens up with more leather and some pleasant tannins indicative of a cigar that will age well. The flavors profile turns bolder and finishes with a full-flavored pepper and spice down to the nub. To summarize, great burning...smooth and warm full flavors.